Telomeres are DNA regions at the ends of chromosomes that protect the genetic data of cells, preventing mutations and alterations in the DNA that could potentially cause disease. Telomeres shorten throughout life in a process involving both genetic and environmental factors. Telomere dysfunction, alterations in the structure and the functioning of telomeres, is one of the molecular mechanisms underlying a number of age-related diseases but, to date, little is known about its possible role in pathologies of the liver such as cirrhosis, hepatitis and liver cancer. Now, researchers from the Spanish National Cancer Research Centre´s (CNIO) have created a mouse model that recapitulates the origin of human diseases associated with long-term or chronic liver damage, such as hepatitis or cirrhosis of the liver which, in turn, can progress to liver cancer over time. This new mouse model reveals telomeric dysfunction as a potential factor in triggering these diseases. The study is published in the Journal of Hepatology. In order to study the relationship between telomeres and liver damage, the researchers generated a mouse line deficient in TRF1 protein in the liver, thus leaving the telomeres in hepatic cells unprotected and compromising their function. TRF1 forms part of a protective complex of human telomeres called shelterin (from the word shelter), which protects the human genetic material. When the researchers administered the hepatotoxic agent CCl4, which is responsible for liver toxicity, to the TRF1 deficient mice they observed that hepatic cells, in addition to containing multiple nuclei, also presented characteristics that are typical of patients with cirrhosis or hepatitis, such as an increase in cellular markers p21, cyclin D1 or PCNA. The team surmise that the current study identifies telomeres as a new molecular route implicated in the origin of liver diseases such as cirrhosis, hepatitis or liver cancer, as well as novel therapeutic approaches to prevent and combat them. 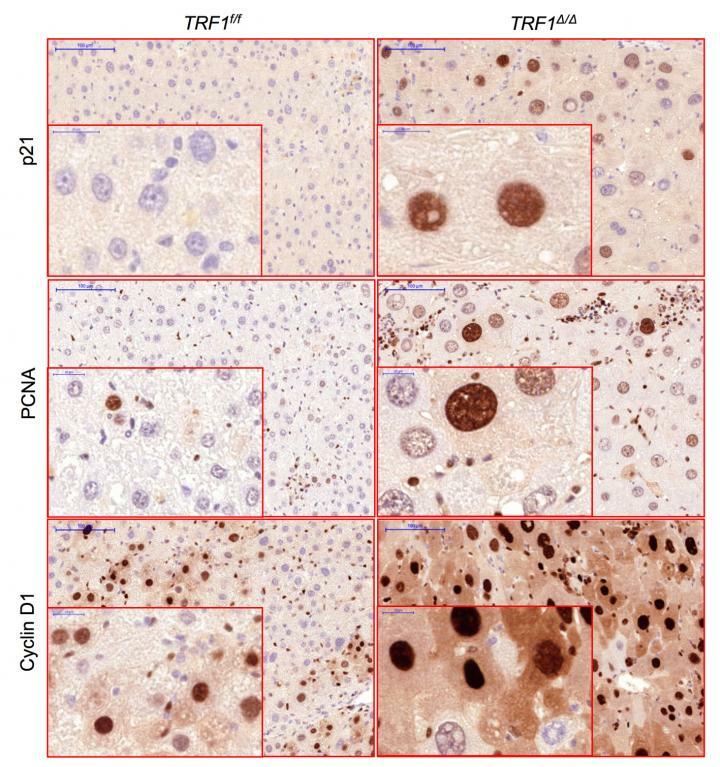 Liver cells lacking TRF1 gene (right) show, under chronic stress, larger nuclei and other markers characteristic of patients with cirrhosis or hepatitis (an increase in p21, PCNA and cyclin D1), when compared to normal cells under the same stimulus (left). Credit: CNIO. I’m an age-rversal coach so I appreciate your reporting on the latest research concerning aging. Great information!